Its hard to find continuity errors in 2001: A Space Odyssey however here are some that I do not think many have discussed. These are specifically the hotel room shots. Just one main element from these scenes is usually examined and that is the clothes inadvertently left on the bed. Its very subtle. At one point there is a massive continuity error – its possible Kubrick did this to provide visual balance however furniture just cant disappear and re-appear! The scenes from the hotel room (or as some describe it, an interstellar bedroom) were filmed in mid June 1966 at MGM Borehamwood. Its said the set was placed upon stilts and studio lights placed underneath. The room got so hot filming was kept to a minimum and the lights switched on only when needed. In one of the scenes it is said Bowman is moving from the wrong side of the room, the direction he is taking is not in sync with other scenes. Nevertheless in the original version of the film, there was far more to the scenes than can be seen today. Some scenes cut were said to show Bowman picking up clothes putting them on the bed, one in particular (as people have recalled from memory) shows him picking up slippers. Clearly Kubrick edited much of this segment of the film to provide more of an enigmatic experience (the same goes for the space station and the AE35 unit failure where a good number of scenes were cut. As people have pointed out these cuts have rendered some scenes slightly unable to explain what is going on. Clearly the hotel room scenes were cut for the same reason however cuts cannot always ensure continuity. If one looks at the same scene (from the washroom) without Bowman, the clothes are not there. Oops! The older Bowman is seen seated at his table, eating dinner…. this is the point where he senses someone is behind (this being himself still in a spacesuit.) He drags his chair back gets up and walks over to the washroom, clearly there’s no-one about so he goes back to the table. Bowman sat back at his table, notice the furniture again. All very well, good continuity here, excellent furniture placement, nothing has been moved. 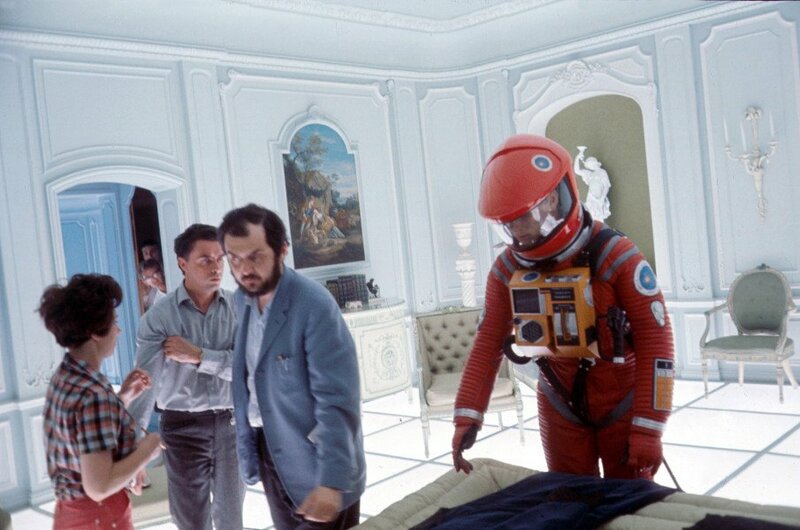 What is important is Kubrick in those particular scenes placed the table at an angle to the room itself. However in these new scenes the table (and Bowman) are placed diagonally. A fuller scene showing the room and we see the table/chair/Bowman are placed exactly in line with the grids on the floor – and the table is set upon the third row of squares from the right. Its just abuting onto the fourth row of squares plus and has been moved back. In this next, even closer shot, which is where Bowman is seen placing the napkin on his lap, the table has been moved yet again. Where it was previously barely encroaching the fourth row of squares in the room, its now right on the fourth row itself and only partially encroaching the third row. What follows next is the classic scene where Bowman knocks the wine glass over and then repositions himself to look at the broken glass on the floor. Its clear from this shot the table (and Bowman himself) were moved forward to the third square from the end of the room. The next scene shows the entire bedroom (complete with older Bowman bedridden.) Its clear from that the lamp on the wall is by the fourth row of squares across the room yet the table is further forward. The props in question were moved back and then moved forward again. Clearly these continuity shots were possibly dicated by lighting and other factors, hence placement of the table and Dullea himself was probably not going to be an exact science. In the next scenes however the set’s furniture does disappear! The famous scene where the monolith makes its final appearance. Look at the furniture placements especially the coffee table and chair by the monolith. Side shot showing the same scene. Or is it? The coffee table and chair seen on the left side of the monolith are no longer there! The monolith too has been moved slightly. It was right on the grid line however its now slightly off centre line. The final scene in the hotel room segement, just as the camera moves towards the monolith. The monolith is back on the grid line itself and the coffee table and chair have returned – although these have been moved onto the third row from the left. The chairs against the wall too have moved a few inches away from each other. The camera then moves right into the monolith and its the film’s ending – 2001’s Star Child accompained by Strauss’ Also Sprach Zarathustra.